Mitsuwa is a Japanese marketplace in the suburbs of Chicago at 100 East Algonquin Road in Arlington Heights. There are several other Mitskwa’s spread out in California and one in New Jersey. Mitsuwa includes a bookstore, video shop, grocery, food court, and bakery. On weekends they tend to have special events. I always love going into the bookstore at Mitsuwa which is right next to the entrance but rarely ever purchase anything. One of the downfalls to Mitsuwa, because almost everything is imported/specialty items it’s all rather expensive, but that I still enjoy looking. The bookstore contains a large variety of Japanese print items such as magazines, books, and manga. They also have a beautiful selection of stationary and gift items as well as anime/manga related stuff. They do carry some English items, some books and a large selection of translated manga. Food isn’t allowed in the bookstore so visit it before any grocery shopping. After a walk past the bookstore, alcohol shop and large selection of sushi is the food court. They have a decent amount of restaurants to choose from. When you order they’ll give you a number and then over the intercom will say the name of the restaurant and the number of the order when it’s ready. During peak meal times it can get packed and lines can be long. Gabuttø burger was suggested to me by a friend and I rather enjoyed it. Their combo option was cheaper, so I got a Gabuttø cheese burger and fries. The Gabuttø burger comes with a special demi-glace sauce. Their fries are a lot of fun because they have a little station set up where you can season the fries with spices/powders. These include options everything from nacho cheese to wasabi. It was fun to mix and match, although some of the containers were put together oddly and sprinkled flavor at different rates. I’ve tried two different things at Kayaba. Their chicken katsu, which comes with miso soup and rice. The first time I had it the miso soup was too salty for me. 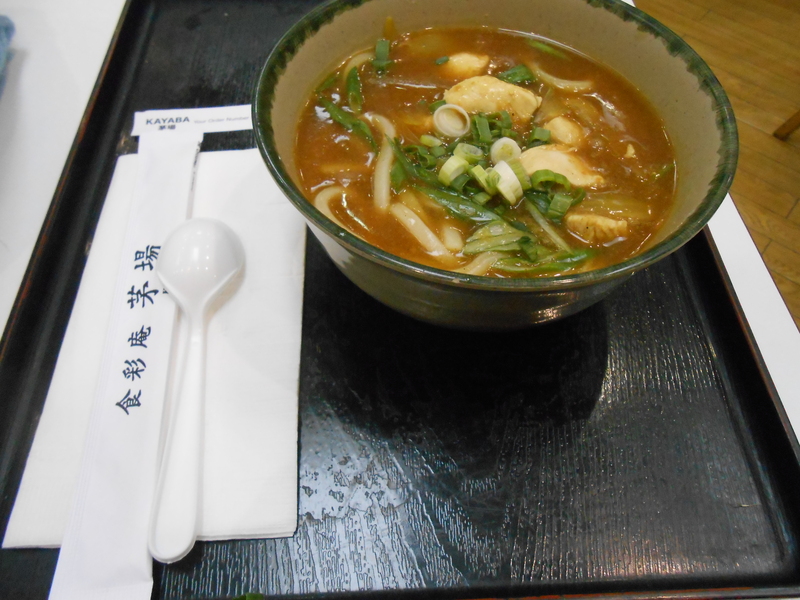 I’ve also enjoyed their chicken curry udon (pictured below) which wasn’t spicy, just a tad of spice, but good. 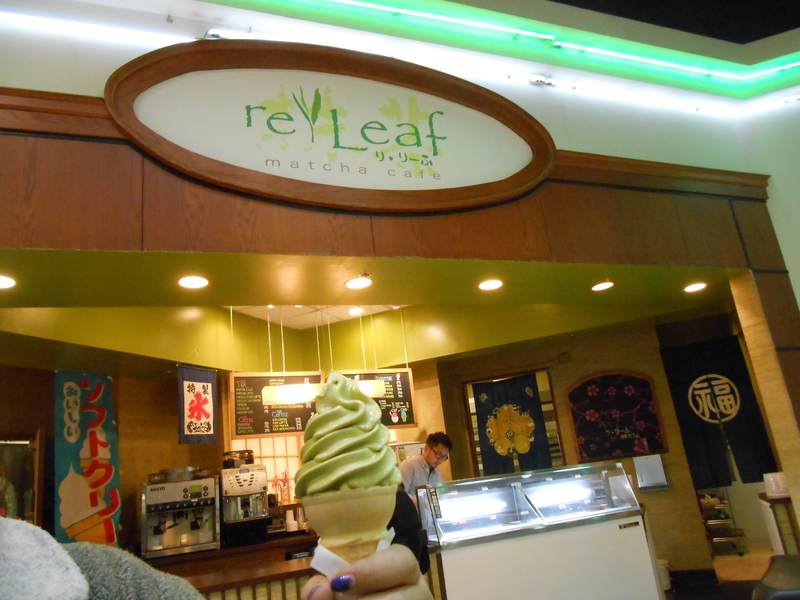 The re Leaf is also located in the food court and sells coffee, tea, smoothies and ice cream. They don’t have a ton of flavors but they make up for it with the diversity that you can’t find elsewhere (except maybe to grab a pint in the grocery store). Flavors like ginger, red bean, sesame, matcha (green tea), and banana. Like most ice cream places they’ll let you sample the flavors. I tried their ginger which was sweet with chunks of ginger in it, which as a person rather fond of ginger I enjoyed and sesame which had an interesting roasted almost coffee taste to it. I ended up getting their soft serve matcha ice cream. The Pastry House Hippo bakery is located on one end of the grocery store, the opposite end of the entrance. Upon entering they have tongues and trays set out. Grab one of each and look around at the different breads to decide what you want and how many you want before checking out. They also have sandwiches, cold and hot drinks, and fancy pastries. My most recent trip I picked up their curry bread, melon pan, and a cream filled pan. My friends also let me try some of their favorites. 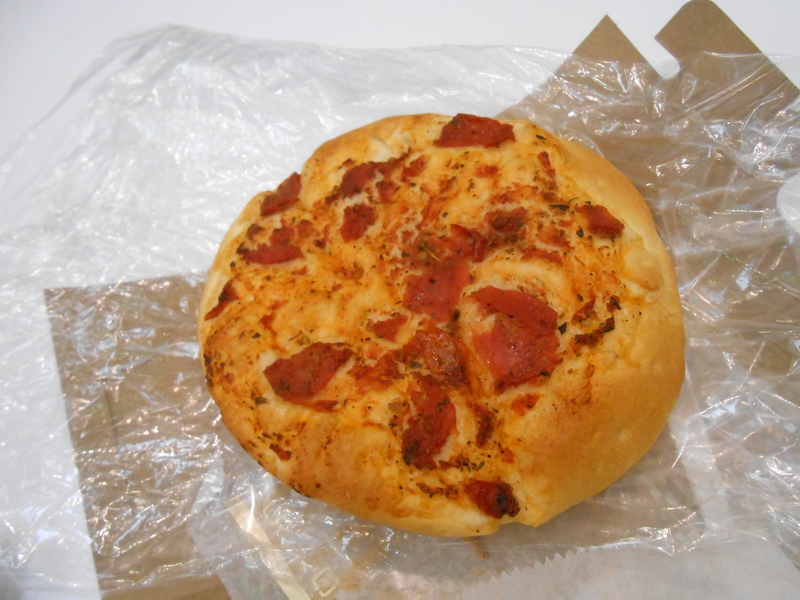 The above picture is of curry bread. 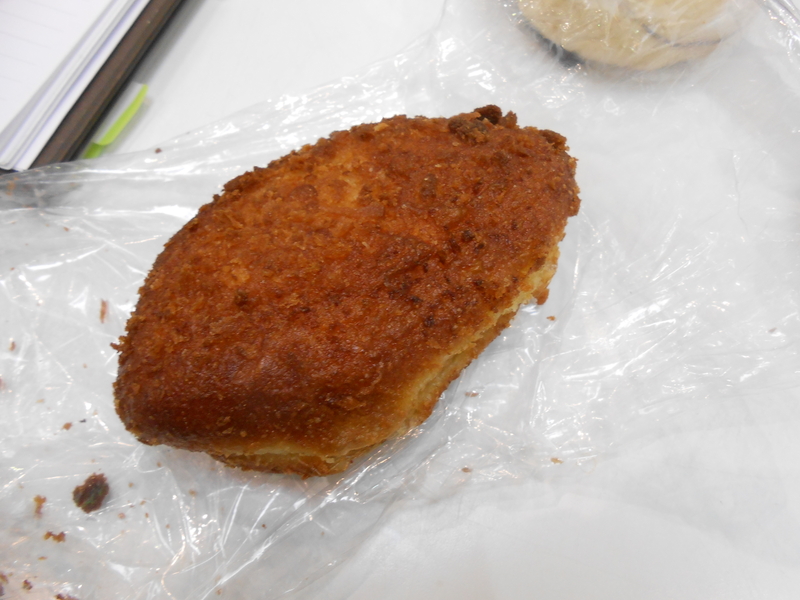 It has a crispy and sweet outside and is filled with curry. It’s served cold and would be amazing warm. Since I had just finished off a large bowl of chicken curry udon I was more excited about sweet bread then savory, but I did enjoy this. 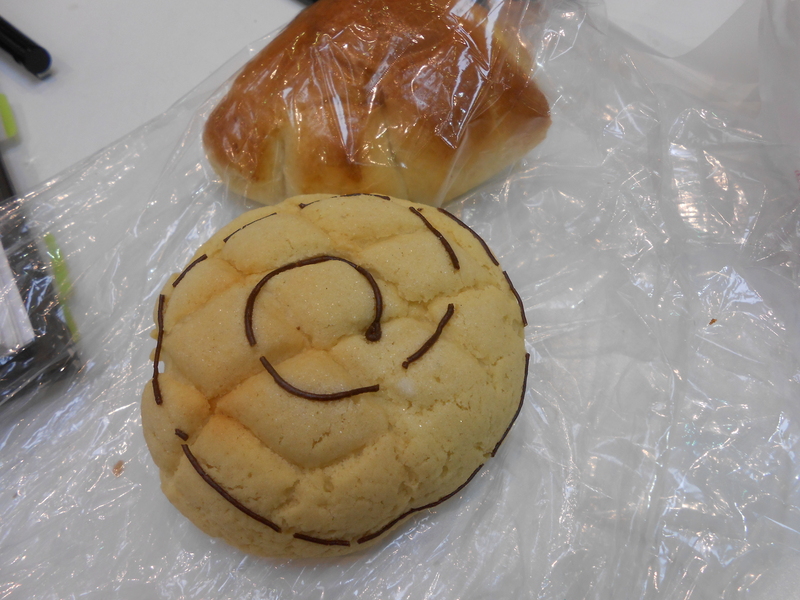 Melon bread (the bread with the swirl) is something I had heard of and always thought it was melon flavored. I picked up a choco one, rather than the plain and was happily surprised to find that it had chocolate chips sprinkled throughout the middle. It also turns out melon bread isn’t called melon bread because of the flavor, some can have melon flavor added, but it actually gets its name from the look of it. I loved it and sort of wish I had gotten more, but it’s probably better that I didn’t. One of my friends ordered one of their pastries. The pastries are one of the items you don’t pick out yourself, along with warm meat/veggie buns they are located near the check out and the workers will get them for you. 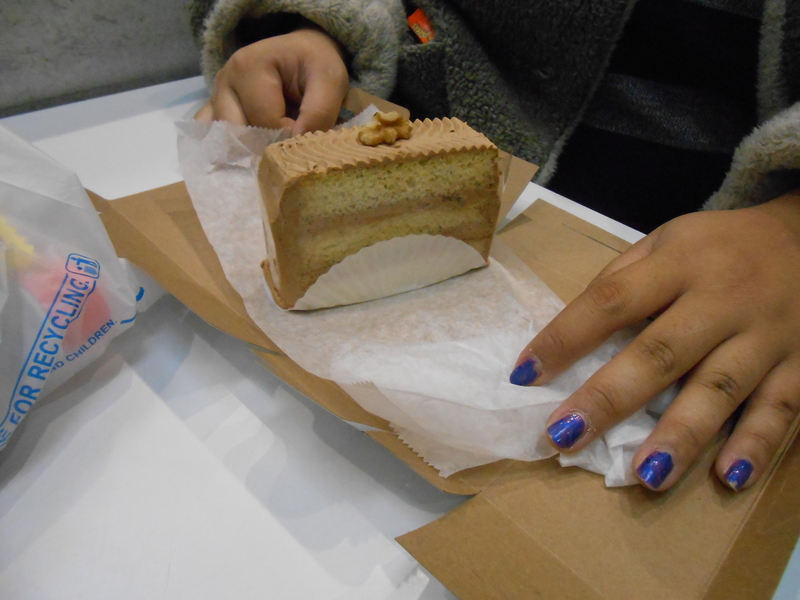 My friend got the English afternoon cake which was a earl grey chocolate cream almond sponge cake. It had a strong earl grey taste to it which was rather nice. I was also introduced to focaccia, which is essentially pizza without the cheese. It’s really good and is another bread that would be amazing warm.